The days are getting warmer, so its time to fire up the barbie and celebrate the return of outdoor dining. Serve these at your next barbecue and everyone will wonder why they didn't think of it themselves. 6 slices smoked Gouda, or Jarlsberg cheese. In a blender or food processor, pulse in batches for about 10 to 15 seconds each, until coarsely ground. In a mixing bowl mix together ground salmon, heavy cream, cornstarch, shallots, chives, parsley, salt, and white pepper until well blended. Shape salmon mixture into six 1/2-inch thick patties. Place patties on waxed paper. Spray with non-stick cooking spray and place in refrigerator for 5 minutes. Place patties, sprayed side down, in centre of cooking grate. Grill 6 to 8 minutes or until well done, turning once halfway through grilling time. 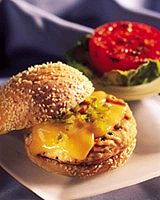 Place each patty on a bun; top with one slice of smoked cheese and 1 tablespoon of pickle relish.